Greece The Rise of the City-State: Athens - HISTORY'S HISTORIESYou are history. We are the future. You'll remember that the geography of Greece naturally divided the country into small regions. Because they were separated by the mountains, these regions developed independent identities. You'll also remember from your last lesson that by the end of the dark ages some of these independent regions, rather than remaining as kingdoms, began to experiment with other forms of government. Above, an artist's view of Athens around 500 BCE. I want to compare the Greek city-states to a family. Like all families, they had a lot in common. By the end of the Dark Ages, the Greek city-states spoke the same language, Greek, and they worshiped the same gods. Each city-state had their own patron god and/or goddess who watched over their city. Just like families, however, each city-state was also unique, different from the other Greek city-states. Some were farming communities; some were fishing and trading communities. They also had all kinds of governments ranging from democracy to kings and everything in between. They had their squabbles and fights, sure, but they always remembered that they were Greek. Every polis, every city-state, fed and protected their own people. As towns grew too big to feed everybody easily, some of the people sailed off and started a new city-state, a new polis. They did not have to travel very far. In the early days of ancient Greece, there were not that many people, but there was a huge coastline. Hundreds of city-states, some of them colonies, were formed, each one an independent country. Wouldn’t it be fun to sail off and start your own country? You’d still be a member of your family. The Greeks felt the same way. The Greeks got together at religious festivals hosted by different city-states throughout the year. Contests of skill were held at these festivals. The Greeks were very competitive. The prize was not money, however. The prize was a simple wreath of olive leaves and fame. It was a big deal for an athlete to win for their city-state. People poured in to watch the games. At the first Olympics in 776 BCE, if asked, a Greek might have answered, “I am a man of Argos” or “I am a man of Corinth.” That they were Greek was obvious. One of the great gifts that our culture traces to the ancient Greeks is democratic government. The word, democracy, literally translates as "people power." Democracy is a type of government that, in the words of Abraham Lincoln in his Gettysburg Address, is "of the people, by the people, for the people." Democracy, however, did not emerge fully-formed in ancient Greece. Instead, it evolved over time. Keeping the evolution toward democratic self-rule in mind, as you read "Acremedes the Assemblyman" pay special attention to the different forms of government that ruled ancient Greece and think deeply about how each type of government brought the Greeks a step closer to democracy, to "people power." Narrator 1: The Dark Age came to an end around 750 BCE. Cities began to grow and trade increased. Leaders stepped forward in each region to organize and govern. Over the years many changes took place before democracy reigned in Greece. Let’s listen as Acremedes and his family and friends tell us how the government of Greece developed. Acremedes: Welcome to my humble home. My father was just telling our three sons about life in Athens, our city-state, long ago. Once the Dark Age ended and trade increased again, over 100 city-states were created. Each city-state was called a polis and it consisted of the city and the farmland surrounding it. Narrator 2: We use the word “polis” today in many forms. For example, a metropolis is a large city. Politics means the art of governing. When someone is considered cosmopolitan, it means that they are very worldly. Daldes: Before the Dark Age, each area was ruled by powerful kings. A king was usually the head of the richest family in the area. 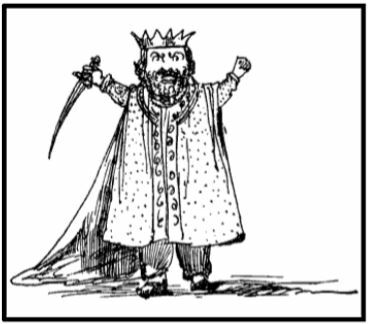 Narrator 3: This system of government was known as a monarchy, or “rule by one.” In a monarchy, the king has power and control over the people in his area. He controls all of the land and natural resources of the region, and he is responsible for all decisions. Another feature of a monarchy was that when the king died, the power would be handed down to his eldest son, thus keeping power in the family. Damian: How could one king defend an entire area? What if the people did not like his decisions? Daldes: The kings would rely on other wealthy families and nobles to help, in return for favors. Naturally, these families soon wanted a share of the power as well. By the end of the Dark Age, many city-states were governed by small groups of nobles who shared equal power. This was better than giving ultimate power to one man alone but still not satisfactory for the majority of the population. Daldes: Different problems arose in the various city-states. Some regions grew too big and couldn’t provide enough food for the population. People grew unhappy and decided to overthrow the leaders. New leaders emerged who promised to make things better. They convinced others to join in their fight and took power by force. Once they changed the government, they ruled single-handedly. Narrator 5: One who assumes ultimate power by force is known as a tyrant, or “ruler who governs in a harsh way”; a dictator. Their government was known as a tyranny. Many tyrants were liked because they let the people have a say in how the government would be changed and made it fair for all of the people, not just the aristocrats. However, other tyrants were harsh and greedy, imposing severe laws and punishments. Many times the people of a polis would throw out one tyrant and replace him with another. Plutarch: If one man had ultimate control again, how was this any different from the monarchies? Daldes: The monarchy was run by a family that was not chosen by the people. A tyrant was supported or thrown out by the will of the population. This was a great step towards democracy because it taught the people of Greece that they could make changes in the government by uniting behind a chosen leader. In fact, when the last tyrant was thrown out of Athens, the people got together and decided to share the decision-making power among themselves. Thus, the first democracy was born. Narrator 6: Democracy comes from the Greek words "demos" and "kratia" and means “rule by the people.” From about 500 BCE, Athens has been a democracy. Plutarch: Father, can we head over to the Agora now? I believe there will be a big trial today, and I was hoping we could go watch the debates. Diedre: Yes, dear. Take the boys for a firsthand lesson in government. I will prepare the evening meal for your return. I will want to hear all about the happenings in the Agora when you come home! 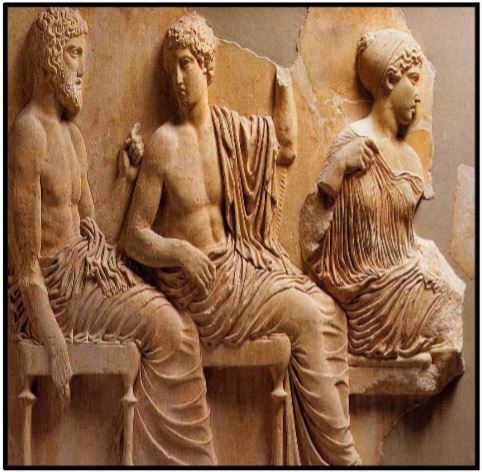 Who was a citizen in ancient Athens? Narrator 7: Although Athens claimed to be a democracy, the citizens making the decisions only made up about 15% of the total population. This included all adult males, over 18 years of age, born in the area. Only men could take part in public life. Women and girls stayed at home, going out only to enjoy the arts,such as theater. They gained their social status from their husbands and male relatives. Even though women and children made up 48% of the population, they had no political rights and could not own land. But they were protected under the law. Women saw their role in the home as an important one, and women were encouraged to be intelligent, strong, and courageous. Acremedes: Come boys, we’re off to the Agora. Who can tell me about the citizens of Athens? Xenos: The citizens of Athens make the laws, hold trials at the assembly, and make all decisions regarding the workings of Athens. But not all men are considered citizens. Some are foreigners, or metics. Metics live and work in Athens but were born outside the city. Metics are protected by law but, like women, they cannot participate in government or own land. Narrator 8: Metics paid taxes and served in the army. Life was not bad for those foreigners who made up about 12% of the population. Many of them had left their own polis in search of work and a better life. They were shopkeepers, craftsmen, and money lenders. Most metics were highly respected within the community. As pictured on the Amphora above, many slaves performed household duties such as child care. Damian: And don't forget the slaves, who make up 25% of the people who live in Athens. Some slaves are purchased from slave traders an some are prisoners of war. They are not considered citizens but, like Athenians, they are protected by laws. Still, they cannot vote, choose their own jobs, or even have families without the permission of their owners. Plutarch: However, most slave are treated well. Many have been set up in business by their masters and share profits. Some work on farms and in houses. Some slaves earn wages and save money to buy their freedom. Acrimedes: Very good boys! I can tell you have been taking our government lessons seriously. Ah, I see my three friends on the far side as we enter the Agora now. I think they have just come from the assembly and can tell you what a trial is like. What role dd the Agora play in the daily life of Athens? Narrator 9: The Agora was a large public meeting place in the center of the town. Here all of the citizens of Athens would gather to listen to the happenings of their polis. Men would discuss politics and business. Groups would gather around speakers attempting to persuade voters before entering the assembly. The Agora was usually a bustle of activity. Sophles: Greetings! I see you have brought the boys along to see the duties of a citizen. Xenos: Here in Athens, we know that democracy doesn't work unless the citizens play an active role in the government of their city-state. After all, democracy means that the people have the power. Attica is divided into 10 tribes and each tribe sends 50 citizens to make up the Council of 500. To make a decision that affects the whole community it is necessary to have an Assembly of at least 6,000 citizens. The Assembly is the place where the business of Athens' government takes place. The Assembly is an opportunity for all male citizens of Athens to speak their minds and exercise their votes regarding the government of their city. At the Assembly, every citizen, no matter their social standing, is encouraged to speak their mind. It is here, at the Assembly, that you will witness the central and most definitive institution of our Athenian Democracy. Hector: Thousands of men are called from all over Attica to be a part of the government. To ensure that even the poor can afford to take time off from their work to participate in their government, those attending the assembly are paid for their duties. This way, rich or poor, every citizen can take part. Plutarch: I think it is a marvelous system! What happens inside the Assembly at a trial? Sophles: In Athens, there are no judges or lawyers, but every trial has hundreds of jurors. Each juror is given two disks, like those pictured at left. The discs serve as ballots for a vote of guilt or innocence. The ballot with a solid center indicates a juror's vote of innocence for the accused. The disc with a hole indicates a vote of guilty. It is from this system that we get the common phrase, "There's a hole in your alibi," meaning that one's story is not believable. People on trial speak in their own defense in front of the Assembly. They may also ask other citizens to speak on their behalf to persuade the jury. Once all speakers have been heard, the jurors each place one voting disk into a jar. CLICK to visit the Agora with Rick Steves. The votes are then counted and the verdict announced. Narrator 10: If the case involved a woman, metic, or slave, a citizen was required to speak on his or her behalf, since these groups were not allowed to directly take part in the trial. A good speaker could sway the jurors to his side regardless of the facts. Xenos: Father, what are those slaves doing over there? Acremedes: Participation in our government is so highly prized that those slaves carry the rope and red paint to mark anyone who seems to be trying to avoid their Assembly duties. A democracy can only work if everyone does his part. It is important that you can understand and accept this great responsibility, because soon you will be a vital part of it. Never forget that participating in government is also a privilege that many people do not enjoy. Plutarch: Thank you for this valuable lesson. I can’t wait to grow up and become an assembly man myself. Brain Box: What were the limitations of the type of democracy practiced in Athens? CLICK to explore more of Athens with the British Museum.